Fashion sneakers and people who have tried them have a love and hate relationship with them. Those who have rocked runners all their lives and are just getting into the more dressy sophisticated stuff, find it absurd to have a shoe with minimal arch and heel support, no matter how good it looks. But then there are people who do not mind a little discomfort so long as they get quality materials and style in the same package. What might look extremely good may not fit too well. On the flip-side, what might fit very well may not have good quality materials and the looks to complement your style. On top of that, there’s the affordability factor that kicks in as you snake up that fashion ladder. So what’s the end to this conundrum? What and how do you choose? I approached Aureus® with no preconceived notions, but with intrigue instead. Truth be told though that all their collections looked bloody damn good and for a great price. Let’s find out if they checked all the four crucial boxes for me and you: Quality, Comfort, Style and Price. An all American brand that started off back in 1977 as the purveyor of high quality golf apparel, Aureus® brand made its presence known throughout the 1980’s. The brand’s offerings were adorned both on and off the lush green by several all-time great professional golfers. The company was named the top-selling golf apparel maker in the US by Golf Pro Merchandiser in 1990. 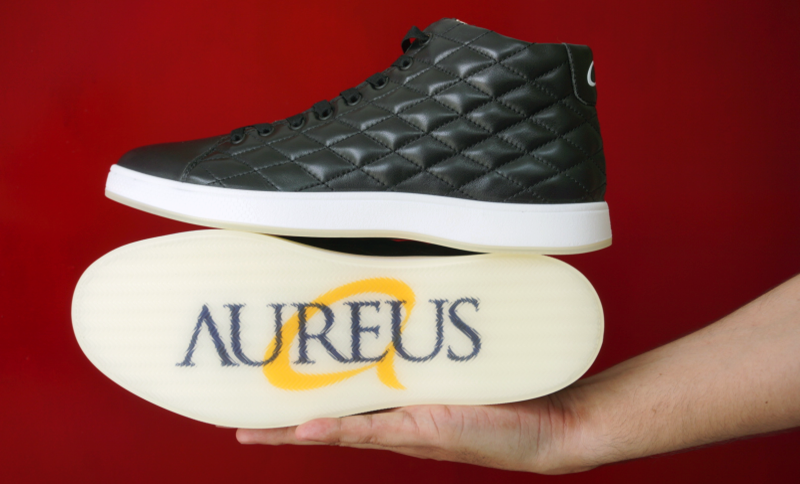 In 2014, Aureus® expanded into the casual and lifestyle footwear segment as part of its natural progression. What is Direct Injection Sole Technology? DIST discards the usage of traditional methods, namely the usage of glue (and any other adhesive) and even stitching to achieve the strongest possible bond in order to deliver unsurpassed durability and longevity to the sole. Basically, it is a process where the sole is molded onto the lasted upper. The soling material (Polyurethane) is liquidized by heating and chemical reaction. It is then poured into the shoe mold while a robot inserts the lasted upper into the mold. Once the sole solidifies, the lasted shoe is detached from the mold. This makes sure the sole will never separate from the shoe no matter how many times you put your toe to the heel of your other foot to slide your foot out of the shoe. People who wear slip-ons more than lace-up shoes know this better than the rest. Aureus employs the usage of DIST for all its shoes while still using eco-friendly materials. I’ve always had a soft spot for quilted leather on shoes. The symmetry and the underlying sewing on the Aureus Lux gives it a refined and upscale look. The upper features quilted full grain leather while the toe-box maintains the clean look. The quilted pattern stitched into the vamp of the shoe goes all the way up to the collar and covers the entire heel. 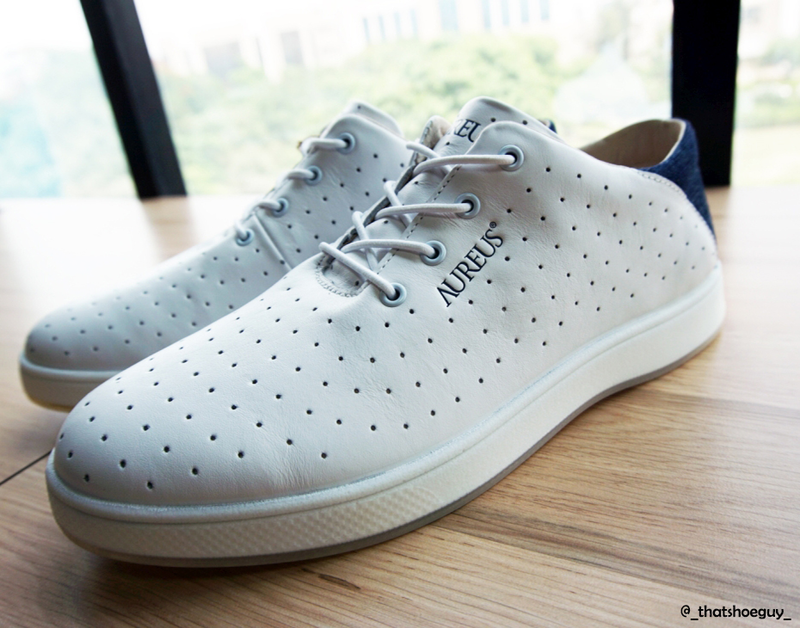 A separate leather panel is stitched onto the heel that bears the big ‘a’ branding in white. The tongue of the shoe is leather as well and has the Aureus stamp in white. The tan colored inside of the tongue carries sizing information and matches with the rest of the shoe’s inner lining. The quilted pattern is stitched with black thread and the tonal theme is kept intact with flat black elastic shoelaces passing through matching metal eyelets. The Lux is love at first sight. Draped in luxurious full grain leather, the shoe gives you that premium look and feel. 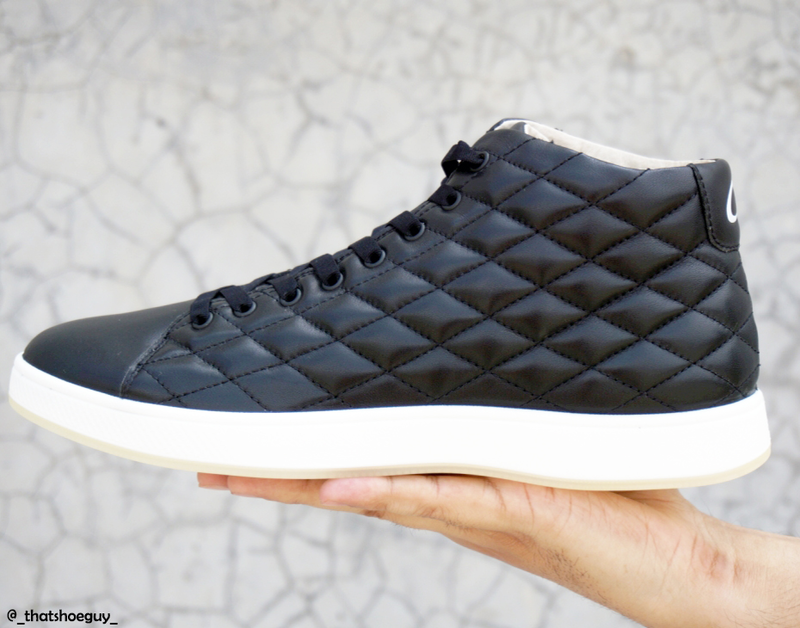 This is the first shoe in the Aureus footwear’s mid-top series to wear the quilted pattern and we definitely hope it’s not the last. The shoe is also available in white and looks just as amazing as its black variant. The AM-TECH® mid-sole does its job perfectly providing plenty of comfort, working in tandem with the PU Insole Cushion. The shoe is surprisingly lightweight and the clear outsole with anti-slip properties has plenty of grip. The overall profile of the shoe is slim and makes it a perfect for parties. You can rock it with denims, corduroy, tweed pants, even fleece joggers and the list goes on. Throw on a quilted black leather jacket or a sports jacket with a pair of denims to match up. The pair is versatile and how you wish to wear it is completely up to you. Just by looking at their catalog, one can already tell Aureus loves playing with materials. Their Maximus low-top in White/Navy is one such hybrid sneaker that features premium 100% genuine Nubuck Leather and combines it with denim. The upper features a fully perforated construction featuring premium nubuck leather, including the tongue. The perforation goes as back as the quarter and as high as the collar. The backstay construction comprises of Denim and adorns the big ‘a’ branding in white. Branding also appears in Navy on the lateral and medial sides of the shoe as well as the tongue. The inner lining on the Maximus comprises of mesh making the shoe breathable and perfect for those long summer days. The throat line of the shoe is laid back which gives the toe-box all the real estate it needs and creates a very unique look. The round white elastic laces passing through the matching eyelets blend into the upper and are very easy on the eyes. The denim panel at the back gets subducted by the white nubuck upper and forms a seam in matching white thread near the quarter. Also, the panel goes all the way down the heel to just stop above the midsole. The direct injected sole construction in white complements the upper and gives it a very clean minimalist yet trendy look. The flexibility of Maximus is second to none. You can rock it with denims, joggers, an overall casual outfit like tee/polo/shirt + jeans or flat front shorts. The shoe comes in multiple colors and if a denim backstay is not your thing, you can opt for the similar priced Maximus Premium/Supreme that replaces the denim with leather. Once again, the shoe is extremely lightweight and the anti-slip sole makes sure you have no bloopers incoming, on your way to looking cool. The Aureus Fortis is a premium Nubuck fortress. The grey all nubuck upper with detailed stitching and a clean perforated toe-box puts it right up there in the slab of stylish designs. The toe-box perforation has a set pattern and gives it a great look while the sawtooth pattern on the vamp of the shoe is probably its best highlight. The matching tonal thread precision-stitching on and around the collar is just fantastic. The heel panel is a separate piece once again with sawtooth pattern along the edges as if demarcating an invisible line for the needles to punch the thread in. Tonal metal eyelets, matching flat grey elastic laces and chocolate tan colored branding on the heel as well as tongue depict that the design team was on point. But wait because the same chocolate tan goodness exists on the inside as well, thanks to the matching genuine leather lining. The collar and tongue are padded for comfort and more snug fit while the PU insole cushion sitting atop that crisp white mid-sole makes sure you can rock the shoe in any urban environment. Aureus Fortis screams quality, is lightweight and really comfortable, comes in three different colors and has a lot of character. You can wear these to work with your shirt and jeans or head over to a lunch date. Designed for the Winter season, Aureus Patron’s Dark Brown Genuine Nubuck leather upper continues the lineage of Aureus’ design philosophy. 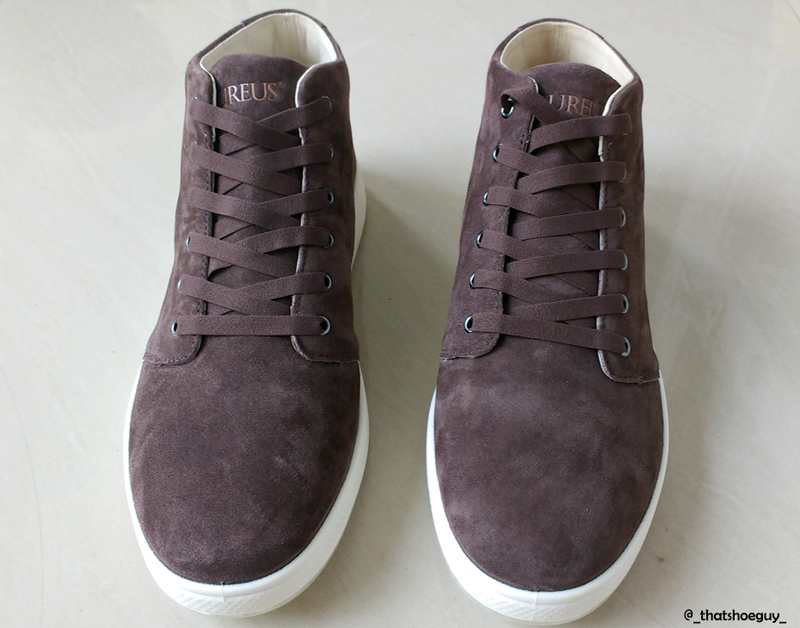 Once again, the upper features dark chocolate brown nubuck leather minus the perforation and branding. Chrome/metal eyelets and flat tonal elastic shoelaces round off the signature simplistic yet stylish look that the brand seems to love. The polyurethane (PU) insole cushioning ensures comfort and plenty of arch support while the PU midsole in crisp white stops you from ogling at the upper too much. The outsole is all thermoplastic polyurethane (TPU) with anti-slip properties. The all dark brown upper gets a hint of chocolate tan on the separately stitched heel panel where the big ‘a’ sits comfortably. The branding also appears in this same color on the tongue which sits amidst a plush leather lining on the inner. Due to no stitching involved between the upper and the mid-sole, the shoe looks like a sculpted and solidified piece of chocolate atop a layer of whipped cream. Complementing the winter colors, the shoe is also available in Wheat, Navy and Silver and can be worn with a variety of clothing including joggers and denim. It’s time to answer the question I had posed to myself in the prelude. You can slide in and out of every pair you’ve seen up top. I’m a US 10 and all the pairs 2 Low-tops, 1 Mid and 1 High-top all fit true to size. The elastic shoe laces idea has been brilliantly executed and gives each pair a very uncluttered look. The vamp, the toebox and the entire upper in general gets to show off and the goods are indeed there. All the aforementioned combined with the ingenuity of its PHENOMENAL in-house design team, converge into every single pair and lend themselves to elevate Aureus’s desirability. Brand names, logos and trademarks used herein remain the property of their respective owners. This listing of any firm or their logos is not intended to imply any endorsement or direct affiliation with Aureus®.